A rosette of wavy blue-green leaves is often the most noticeable part of the soap plant. 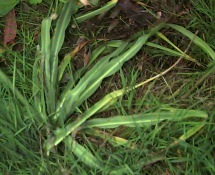 The leaves may grow up to 2 feet long, flattened against the ground. In May or June these leaves start to wither as a stout stem 2 to 4 feet high rises from the root stalk. Dainty blue-veined white flowers appear successively up the stalk, opening briefly in the afternoon. The descriptive name, pomeridianum, means "opening in the afternoon." The large deeply seated bulb is covered with coarse fibers. Soap plant grows in dry open places throughout the Sacramento region. Indians had many uses for this plant. The bulb was baked for food, and the coarse fibers were used to make brushes. The crushed bulb made a soapy lather that was used as a shampoo. This same material was used to help catch fish. It was put into low flowing streams where it would get into the gills of fish so they could not breathe. The crushed bulb also made a glue used variously for fletching arrows, putting backings on bows, and making brush handles. The mashed bulb was applied to relieve sores and poison oak rash and to cure rheumatic pains and cramps. In addition to the bulb, very young shoots proved to be a very sweet food when cooked slowly in a pit oven. When still young, the fresh green leaves were sometimes eaten raw. The older leaves were used for wrappong acorn bread during baking. Juice from the leaves was pricked into the skin for green tattoo markings. 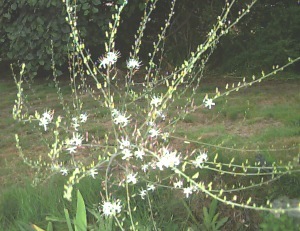 A similar plant with narrower, somewhat less wavy leaves, is Chlorogalum angustifolium.